(ABC NEWS) — Coded references to New Testament Bible passages about Jesus Christ are inscribed on high-powered rifle sights provided to the United States military by a Michigan company, an ABC News investigation has found. Trijicon confirmed to ABCNews.com that it adds the biblical codes to the sights sold to the U.S. military. Tom Munson, director of sales and marketing for Trijicon, which is based in Wixom, Michigan, said the inscriptions “have always been there” and said there was nothing wrong or illegal with adding them. Munson said the issue was being raised by a group that is “not Christian.” The company has said the practice began under its founder, Glyn Bindon, a devout Christian from South Africa who was killed in a 2003 plane crash. 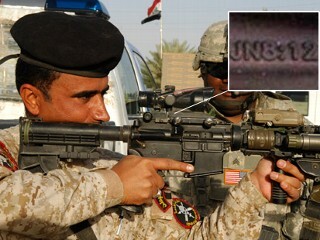 The biblical references appear in the same type font and size as the model numbers on the company’s Advanced Combat Optical Guides, called the ACOG. According to a government contracting watchdog group, fedspending.org, Trijicon had more than $100 million in government contracts in fiscal year 2008. The Michigan company won a $33 million Pentagon contract in July, 2009 for a new machine gun optic, according to Defense Industry Daily. The company’s earnings from the U.S. military jumped significantly after 2005, when it won a $660 million long-term contract to supply the Marine Corps with sights.